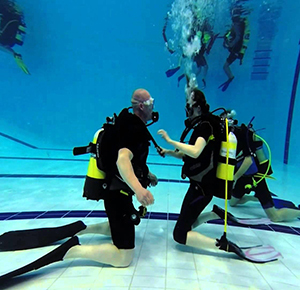 Scuba training starts with the Branch Diver Award which consists of a series of training excercises and assessments in the pool followed by similar activities and assessment in open water. To compliment the practical aspect, there is also a short theory assessment based on the lectures which form the backbone of the training. The main advantage of training in the club system is that the training can be tailored to you. There is no pressure or time constraints when training with us. 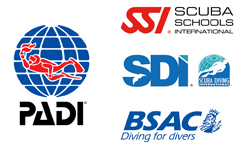 The next step up, and the most commonly held qualification is the ScotSAC Sport Diver. This award which is at the same level as a PADI rescue diver, will allow you to dive to a depth of 30m, opening up the vast majority of the world's best dive sites. Our training is specifically designed for diving in Northern UK waters and incorporates rescue and first-aid training, even at Sport Diver level. Drysuit training is also introducted from the very beginning of your open-water training. Scotsac follows a standard training schedule made up of the four core diver awards, and a number of additional endorsements or specialities. Already a diver with another club/organisation? Scotsac welcomes divers with previous experience and/or qualifications. Upon joining, you can join us on dives that fall within the limits of your current qualifications. The only exception would be if you learned to dive abroad in warm water, you would need to complete the drysuit endorsement before doing a drysuit dive in the UK. If you wish to continue training and upgrade your qualification, the Branch Diving Officer can review your previous diving qualifications and experience and advise on any training or assessments required to progress to the next level. Visit the crossover page on the ScotSAC website for more information. Scotsac are very keen to encourage divers to become instructors themselves, something that can be very rewarding and which essentailly keeps the club system alive. Scotsac rely on volunteers to provide training at both local and national levels, as well as to organise events and sit on committees. Each and every volunteer plays a vital part in keeping Scotsac alive and thriving, giving whatever time they are able to offer. 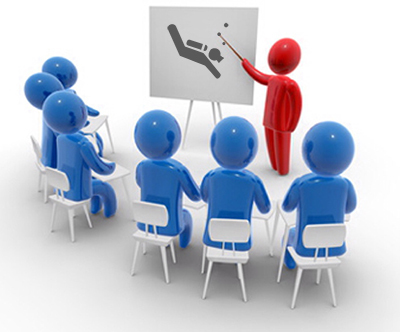 As with the Scuba Diver awards, ScotSAC have a similar training program for instructors; from the Branch Instructor delivering training at a local level, through to Regional Instructor and Club Examiner. What equipment do I need to start diving? None! All equipment is provided free of charge during your training. (The only exception to this is a drysuit for use in the open water. However, you can hire these from the local dive shops until you want to commit to buying one). Normally trainees start to purchase basic pieces of equipment as their training progresses (eg. mask, snorkel, fins). Training is provided free of charge to all club members. All that is required is you join the Scottish Sub-Aqua Club (this is required to cover you for insurance purposes) and become a member of the club. Please see the membership section for more details. You have to be at least 18 years old to start training to be a diver with the club. We do occasionally train 16-17 year olds but we ask that you bring a parent or guardian with you (who will be welcome to train too!). Diving requires you to be reasonably fit and be fairly confident in the water. There is a short swimming assessment at the start of your dive training which requires you to be able to swim 8 lengths of the pool without stopping (freestyle) and 4 lengths backstroke, along with some other tasks such as retrieving items from the bottom, treading water etc. You should be able to complete these tasks without over exherting yourself. I have a medical condition, can I still dive? All diving members of The Scottish Sub Aqua Club must complete a medical self declaration to confirm their fitness to dive. Any Member answering 'Yes' to any of the questions on the self declaration will automatically be referred to the ScotSAC Medical Advisor, a practicing GP and diving doctor. In most cases this is a simple process and involves the Medical Advisor reviewing the information you provide on your form to determine your fitness to dive. In a small number of cases, you may be contacted for further information, or asked to visit a diving doctor for a full medical. A copy of the form is available here for your information. If you have any questions that are not answered on these pages, feel free to drop us a message or come down to our pool session on a Friday night.